Here are 59 questions from the DVSA revision question bank on safety margins in the highway code including as braking distances, wind/snow/wet weather conditions, overtaking. The average score for this test is 86%. Can you beat that? In icy and snowy weather, your stopping distance will increase by up to ten times compared to good, dry conditions. Take extra care when braking, accelerating and steering, to cut down the risk of skidding. In strong winds riders of two-wheeled vehicles are particularly vulnerable. When you overtake them allow plenty of room. Always check to the left as you pass. Selecting a low gear when travelling downhill will help you to control your speed. The engine will assist the brakes and help prevent your vehicle gathering speed. The anti-lock braking system will operate when the brakes have been applied harshly. It will reduce the chances of your car skidding, but it is not a miracle cure for careless driving. Extra care should be taken in wet weather as, on wet roads, your stopping distance could be double that necessary for dry conditions. Deep water can affect your brakes, so you should check that they’re working properly before you build up speed again. Before you do this, remember to check your mirrors and consider what’s behind you. By driving all four wheels there is improved grip, but this does not replace the skills you need to drive safely. The extra grip helps road holding when travelling on slippery or uneven roads. 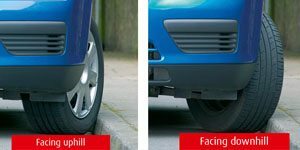 Turning the wheels towards the kerb will allow it to act as a chock, preventing any forward movement of the vehicle. It will also help to leave it in gear, or select 'Park' if you have an automatic. Only travel if you have to. Making unnecessary journeys in bad weather can increase the risk of having a collision. It’s important that you can see and be seen. Make sure any snow or ice is cleared from lights, mirrors, number plates and windows. Keep pressure on the brake pedal until you have come to a stop. The anti-lock mechanism will activate automatically if it senses the wheels are about to lock. If the steering becomes light in these conditions it is probably due to a film of water that has built up between your tyres and the road surface. Easing off the accelerator should allow your tyres to displace the film of water and they should then regain their grip on the road. Even in good conditions it will usually take you further than you think to stop. Don’t just learn the figures, make sure you understand how far the distance is. When driving on downhill stretches of road selecting a lower gear gives increased engine braking. This will prevent excess use of the brakes, which become less effective if they overheat. Your tyre grip is greatly reduced on icy roads and you need to allow up to ten times the normal stopping distance. In windy conditions, care must be taken on exposed roads. A strong gust of wind can blow you off course. Watch out for other road users who are particularly likely to be affected, such as cyclists, motorcyclists, high-sided lorries and vehicles towing trailers. Harsh use of the accelerator, brakes or steering are likely to lead to skidding, especially on slippery surfaces. Avoid steering and braking at the same time. In icy conditions it’s very important that you constantly assess what’s ahead, so that you can take appropriate action in plenty of time. The anti-lock braking system has sensors that detect when the wheels are about to lock. It releases the brakes momentarily to allow the wheels to revolve and grip, then automatically reapplies them. This cycle is repeated several times a second to maximise braking performance. Steer into the skid but be careful not to overcorrect with too much steering. Too much movement may lead to a skid in the opposite direction. Skids don’t just happen, they are caused. The three important factors in order are, the driver, the vehicle and the road conditions. A skid happens when the driver changes the speed or direction of their vehicle so suddenly that the tyres can't keep their grip on the road. Remember that the risk of skidding on wet or icy roads is much greater than in dry conditions. Stopping distances are affected by a number of variable factors. These include the type, model and condition of your vehicle, road and weather conditions, and your reaction time. Look well ahead for hazards and leave enough space between you and the vehicle in front. This should allow you to pull up safely if you have to, without braking sharply. In a contraflow system you'll be travelling close to oncoming traffic and sometimes in narrow lanes. You should get into the correct lane in good time obey, the temporary speed limit signs and keep a safe separation distance from the vehicle ahead. If the wheels of your vehicle lock they will not grip the road and you will lose steering control. In good conditions the anti-lock system will prevent the wheels locking and allow you to retain steering control. Driving at a slow speed in a high gear will reduce the likelihood of wheel-spin and help your vehicle maintain the best possible grip. Preventing the wheels from locking means that the vehicle’s steering and stability can be maintained, leading to safer stopping. However, you must ensure that the engine does not stall, as this could disable the power steering. Look in your vehicle handbook for the correct method when stopping in an emergency. If an anti-lock braking system is fitted it activates automatically when maximum braking pressure is applied or when it senses that the wheels are about to lock. It prevents the wheels from locking so you can continue to steer the vehicle during braking. It does not remove the need for good driving practices such as anticipation and correct speed for the conditions. If the road surface becomes very hot it can soften. Tyres are unable to grip onto a soft surface as well as they can a firm dry one. Take care when cornering and braking. Coasting, is the term used when the clutch is held down, or the gear lever is in neutral, and the vehicle is allowed to freewheel. This reduces the driver’s control of the vehicle. When you coast, the engine can’t drive the wheels to pull you through a corner. Coasting also removes the assistance of engine braking that helps to slow the car. Poor contact with the road surface could cause one or more of the tyres to lose grip on the road. This is more likely to happen when braking in poor weather conditions and when the road has a loose or uneven surface. If your car is fitted with anti-lock brakes they will take effect when you use them very firmly in an emergency. The system will only activate when it senses the wheels are about to lock. If you’re travelling on an icy road extra caution will be required to avoid loss of control. Keeping your speed down and using the highest gear possible will reduce the risk of the tyres losing their grip on this slippery surface. One useful method of checking that you’ve allowed enough room between you and the vehicle in front is the two-second rule. To check for a two-second time gap, choose a stationary object ahead, such as a bridge or road sign. When the car in front passes the object say 'Only a fool breaks the two-second rule'. If you reach the object before you finish saying it you're too close. Look well ahead down the road as you drive and give yourself time and space to react safely to any hazards. You may have to stop in an emergency due to a misjudgement by another driver or a hazard arising suddenly such as a child running out into the road. In this case, if your vehicle has anti-lock brakes, you should apply the brakes immediately and keep them firmly applied until you stop. If you attempt to move off in a low gear, such as first, the engine will rev at a higher speed. This could cause the wheels to spin and dig further into the snow. Be aware this is just the braking distance. You need to add the thinking distance to this to give the OVERALL STOPPING DISTANCE. At 50 mph the typical thinking distance will be 15 metres (50 feet), plus a braking distance of 38 metres (125 feet), giving an overall stopping distance of 53 metres (175 feet). The distance could be greater than this depending on your attention and response to any hazards. These figures are a general guide. Before you test your brakes you must check for following traffic. If it is safe, gently apply the brakes to clear any water that may be covering the braking surfaces. When stopping in an emergency anti-lock brakes will help you continue to steer when braking. In poor weather conditions this may be less effective. You need to depress the clutch pedal to prevent the car stalling as most power steering systems use an engine-driven pump and will only operate when the engine is running. Look in your vehicle handbook for the correct method when stopping in an emergency. Water on the brakes will act as a lubricant, causing them to work less efficiently. Using the brakes lightly as you go along will dry them out. You should always consider the conditions and drive accordingly. Once you have applied the brake keep your foot firmly on the pedal. Releasing the brake and reapplying it will disable the anti- lock brake system. If you drive at speed in very wet conditions your steering may suddenly feel lighter than usual. This means that the tyres have lifted off the surface of the road and are skating on the surface of the water. This is known as aquaplaning. Reduce speed but don’t brake until your steering returns to a normal feel. On gravel or loose surfaces anti-lock brakes (ABS) may be ineffective. ABS may also be ineffective in very wet weather when water can build up between the tyre and the road surface. This is known as aquaplaning. Note that this is the typical stopping distance. It will take at least this distance to think, brake and stop in good conditions. In poor conditions it will take much longer. Don’t venture out if your journey is not necessary. If you have to travel and someone is expecting you at the other end, let them know that you’ll be taking longer than usual for your journey. This will stop them worrying if you don’t turn up on time and will also take the pressure off you, so you don’t feel you have to rush. Many towns have speed humps to slow down traffic. Slow down when driving over them. If you go too fast they may affect your steering and suspension, causing you to lose control or even damaging it. Be aware of pedestrians in these areas. Anti-lock brakes will not be required when braking normally. Looking well down the road and anticipating possible hazards could prevent you having to brake late and harshly. Knowing that you have anti-lock brakes is not an excuse to drive in a careless or reckless way. Drive extremely carefully when the roads are icy. When travelling on ice, tyres make virtually no noise and the steering feels light and unresponsive. In icy conditions be very gentle when braking, accelerating and steering. On busy roads traffic may still travel at high speeds despite being close together. Don’t follow too closely to the vehicle in front. If a driver behind seems to be ‘pushing’ you, gradually increase your distance from the vehicle in front by slowing down gently. This will give you more space in front if you have to brake, and lessen the risk of a collision involving several vehicles. When it’s foggy use dipped headlights. This will help you see and be seen by other road users. If visibility is seriously reduced consider using front and rear fog lights if you have them. Keep a sensible speed and don’t follow the vehicle in front too closely. If the road is wet and slippery you’ll need to allow twice the normal stopping distance. Sometimes you may not be able to see that the road is icy. Black ice makes a road look damp. The signs that you’re travelling on black ice can be that the steering feels light or that the noise from your tyres suddenly goes quiet. Doing this will give you an earlier view around the bend and enable you to see any hazards sooner. Doing this will give you an earlier view around the bend and enable you to see any hazards sooner. It also reduces the risk of collision with an oncoming vehicle that may have drifted over the centre line while taking the bend. Releasing the brake before you have slowed right down will disable the system. If you have to brake in an emergency ensure that you keep your foot firmly on the brake pedal until the vehicle has stopped. Wet weather will affect the time it takes for you to stop and can affect your control. Your speed should allow you to stop safely and in good time. If another vehicle pulls into the gap you’ve left, ease back until you’ve regained your stopping distance. It is easy for motorcyclists to be blown off course. Always give them plenty of room if you decide to overtake, especially in strong winds. Decide whether you need to overtake at all. Always check to the left as you pass. Braking on snow can be extremely dangerous. Be gentle with both the accelerator and brake to prevent wheel- spin. If you drive at speed in very wet conditions your steering may suddenly feel ‘light’. This means that the tyres have lifted off the surface of the road and are skating on the surface of the water. This is known as aquaplaning. Reduce speed by easing off the accelerator, but don’t brake until your steering returns to normal.